Proforma Invoice Sample No Commercial Value is a sub-topic of Sample Proforma Invoice , Commercial Invoice Template . 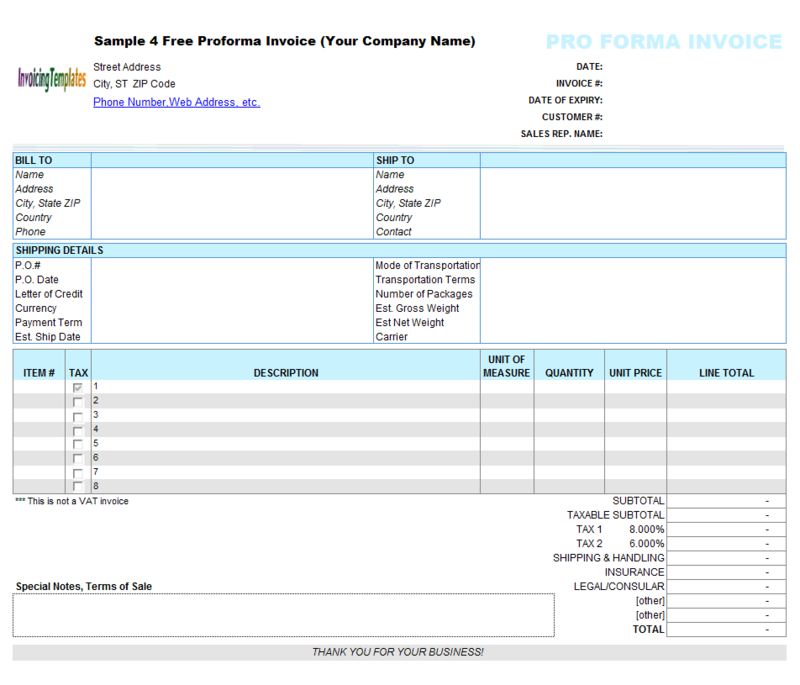 Here are our templates closely related to Proforma Invoice Sample No Commercial Value. This free sample proforma invoice templates differs from the previous proforma invoice forms in that the layout is customized to be printable on standard A4 paper with landscape page orientation. 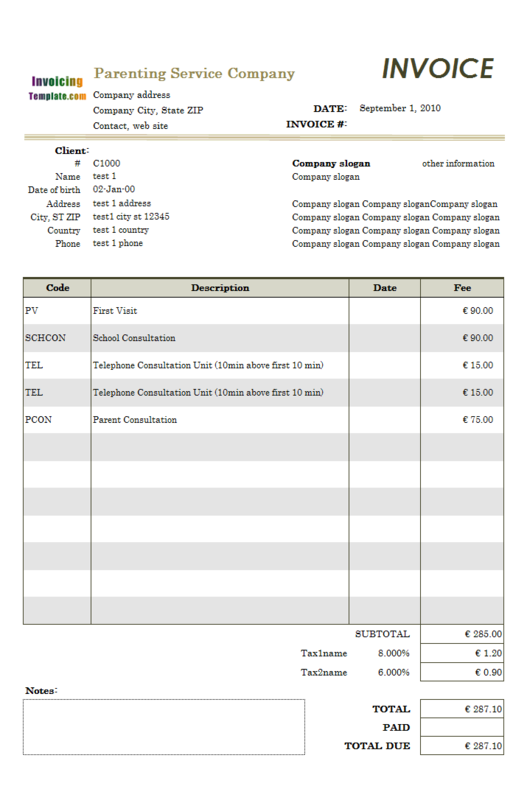 In order to create this template from the original Proforma Invoicing Form (c7010), we firstly set the taxing mode of the template to one tax by using Invoice Manager for Excel (namely Uniform Invoice Software). The second category includes "Payment Term", "Shipping Method" (or "Shipping via"), "Customer Category", "Product Category" and "Sales Rep. Name". The default values of these fields can be changed manually by following the steps below. 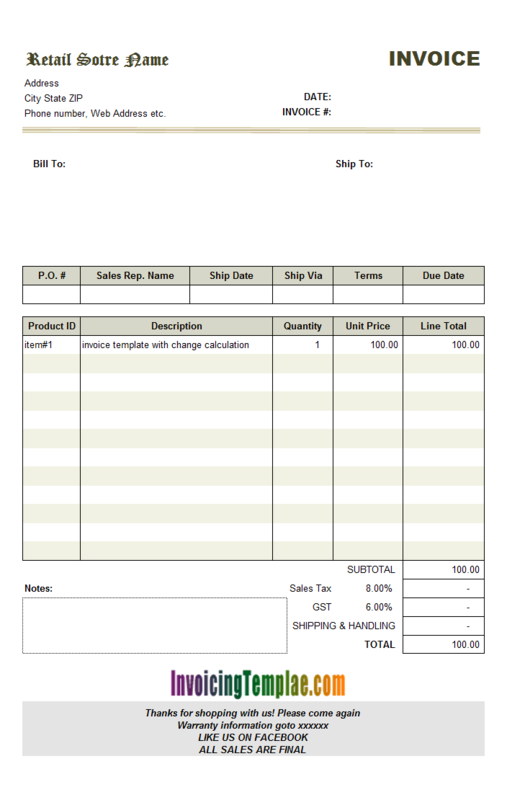 Handyman Bill Sample (No Tax) is a sample based on c7006 Handyman bill format. 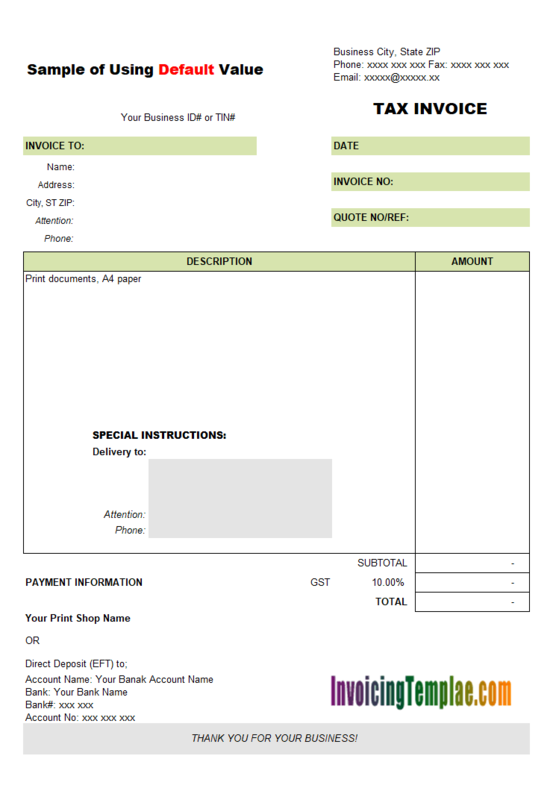 Unlick the original template, where the invoicing items are charged with either one or two taxes (GST and PST), this handyman bill format charges no tax. 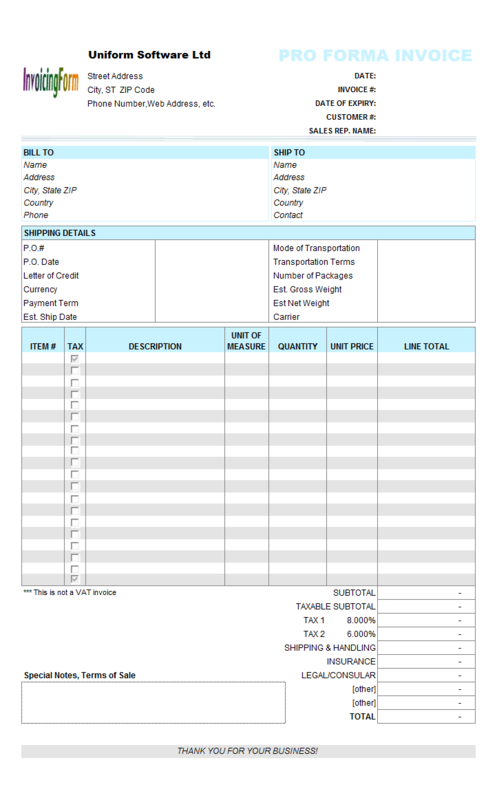 First, open the original ".xls" formatted proforma invoice template in Excel 2010 (Excel 2007 and all the later versions support ".xlsx" spreadsheet format). Click Excel menu File / Save As. If you have Invoice Manager for Excel (namely Uniform Invoice Software) installed, a warning message appears that says "If you save this workbook with a different file name, you must re-open it to ensure Invoice Manager for Excel (namely Uniform Invoice Software) functions properly. Are you sure you want to continue? " Choose Yes. On the "Save As" dialog box, choose "Excel Workbook" from the "Save as type" drop-down list. Name the new template "proforma 1st sample", or something else you like. If you have Invoice Manager for Excel (namely Uniform Invoice Software) installed, you may find that after executing Excel "Save As" command, all the buttons on the new template stop working. This is not a bug, bug by design - as stated above, you need to close and then reopen the template if you want to make the buttons work. But for the purpose of this sample, we'll skip this step. 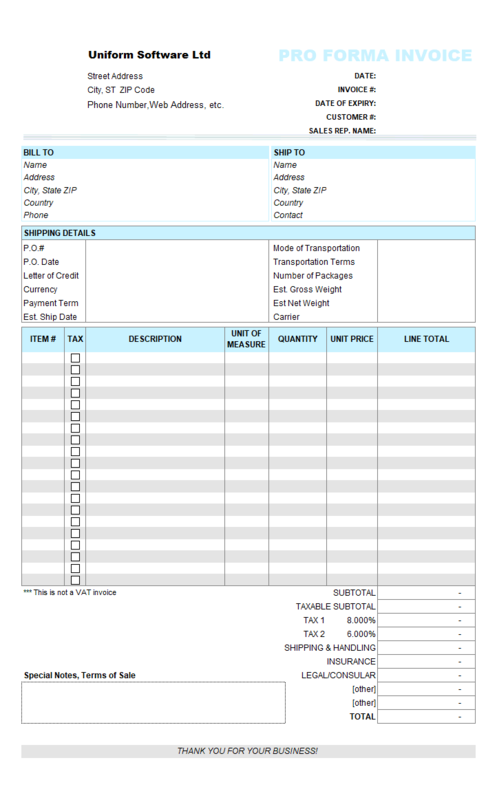 Now unprotect the Invoice worksheet. To do this in Excel 2010, go to the "Review" ribbon tab and click the Unprotect Sheet command. 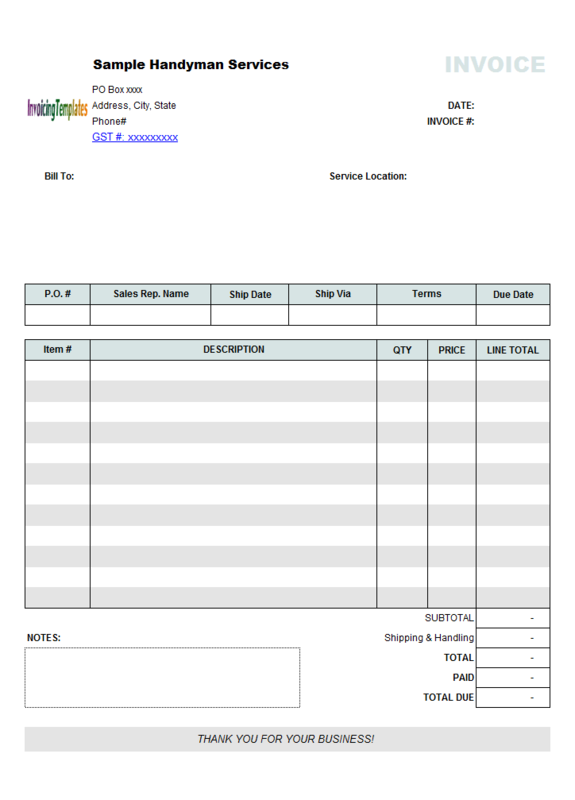 The background color we used for the labels "SHIP TO", "BILL TO", "SHIPPING DETAILS" and the heading line of the invoice body, as well as the fore color of the big title "PRO FORMA INVOICE", is a custom color defined in Excel palette. 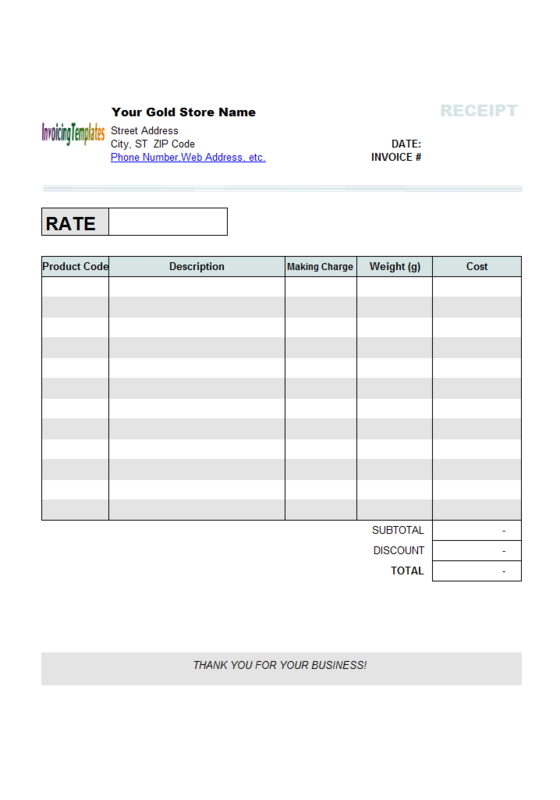 You can find this color on many of the templates designed by us here on InvoicingTemplate.com - In fact, we use this color since 2005 - when we released Excel Invoice Manager for the first time. To make sure all of our templates have a similar style, this color has never been changed. How do I easily change colors of an invoice design? 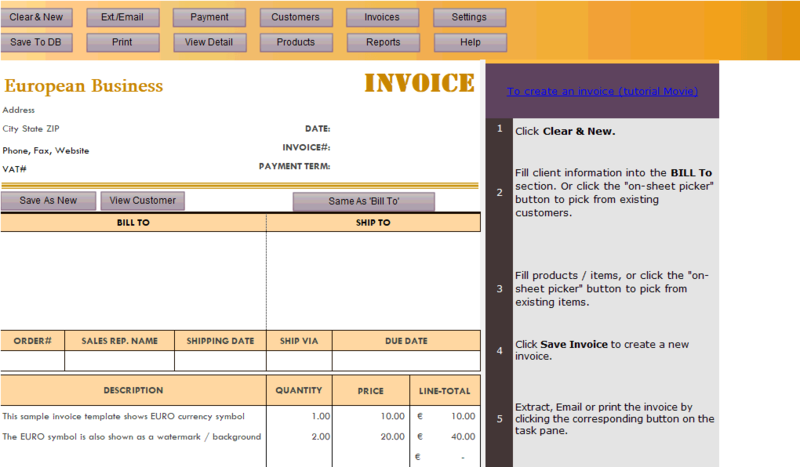 Once returned to the Invoice worksheet, you can find the new color applied to the invoice form. See the figures below to find an example. Now right-click the InvoicingTemplates logo image and choose Properties from the shortcut menu. The Properties box appears. Look for the Picture property, and click the button on that line. Excel shows you a dialog box that allows you to browse to and specify your own logo image. Depending on your Excel version, the supported image file formats may vary, but JPG, PNG and GIF formats are good choices for storing your logo image that are likely supported by your Excel. 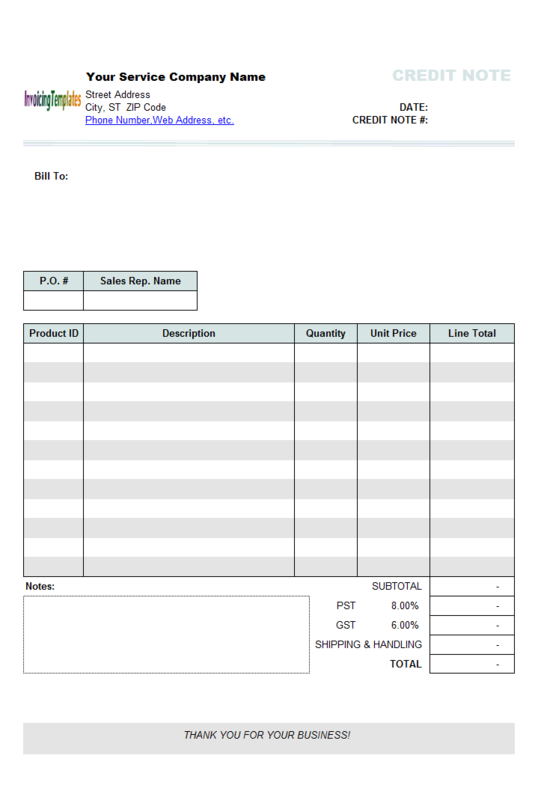 The default implementation of the Proforma Invoice Template here on InvoicingTemplate.com has a currency field on the Shipping Details section, which is a manually editable field. In practice the currency usually could be picked up from a limited set. For this reason, it could be implemented as a drop-down list, instead of a manually editable field. The benefit of using a drop-down list here is obvious - it is not only easy to use than a manually editable field, but also avoids typo mistakes. And the best part is that, Microsoft Excel provides direct support for this. 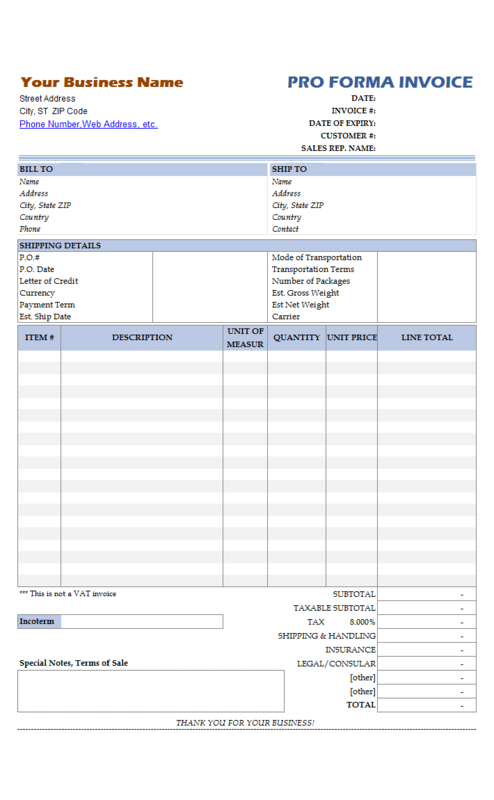 Here are the steps to add the currency drop-down list to the pro forma invoice template. A credit note is also called credit memo (memorandum). It is a commercial document issued by a seller to a buyer and states the amount of money that has been credited to the buyer's account. 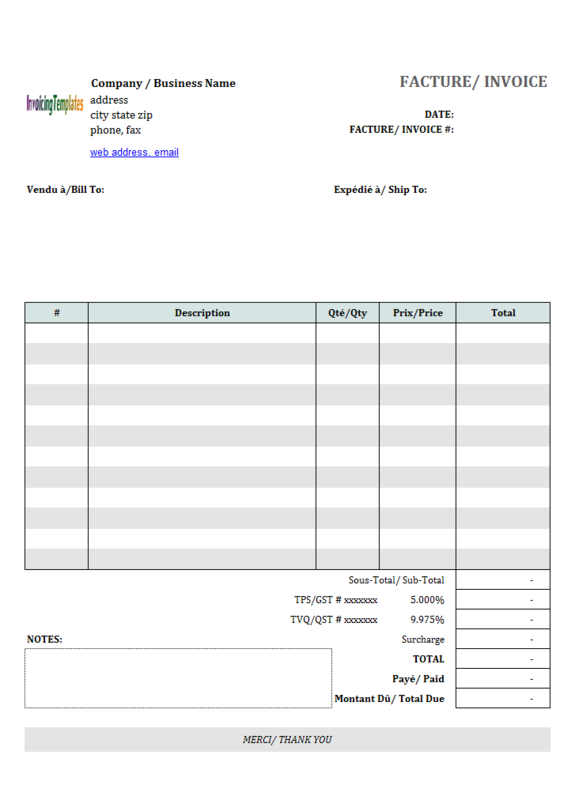 The credit note format available for free here on InvoicingTemplate.com was originally a sample on customizing the default sales invoice template shipped with Invoice Manager for Excel (namely Uniform Invoice Software), and it is now provided as a free template. The credit note template is offered in Microsoft Excel (.xls) format, which you can easily convert to the new (.xlsx) format by executing the "Save As" command in Microsoft Excel. 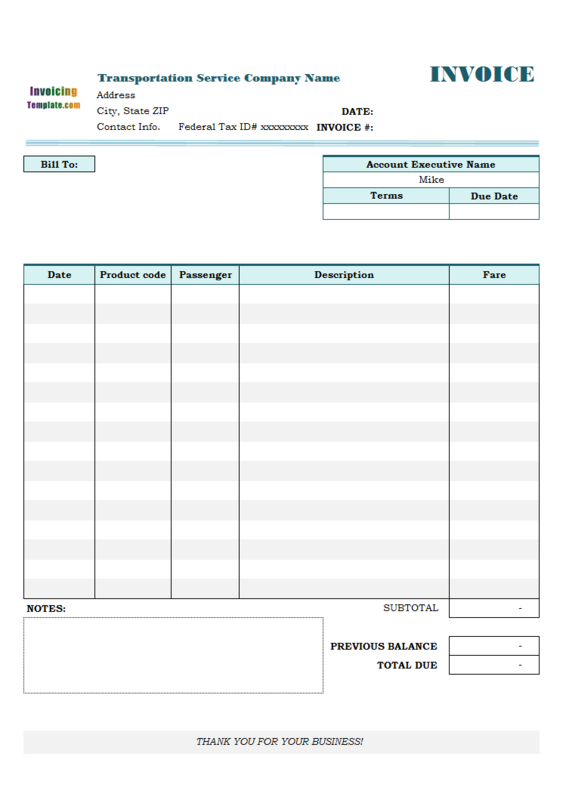 To make the default invoice template suitable for use by transportation / taxi / limousine service company, this customized service invoice template uses several custom fields, as detailed in the following table. The "Advertisement" section is an auxiliary section, which is not directly related to your bills or invoices, but allows you to put a brief description about your business and service, or you can also put your payment term, service term here. Note that this is a static text section - you can modify it once the template is switched to design mode, but when you are creating invoices, this section is protected and thus couldn't be modified. This also means that the section is not defined as a field in the database, and thus cannot be changed from invoice to invoice. This template has one single tax named "VAT" set by default. 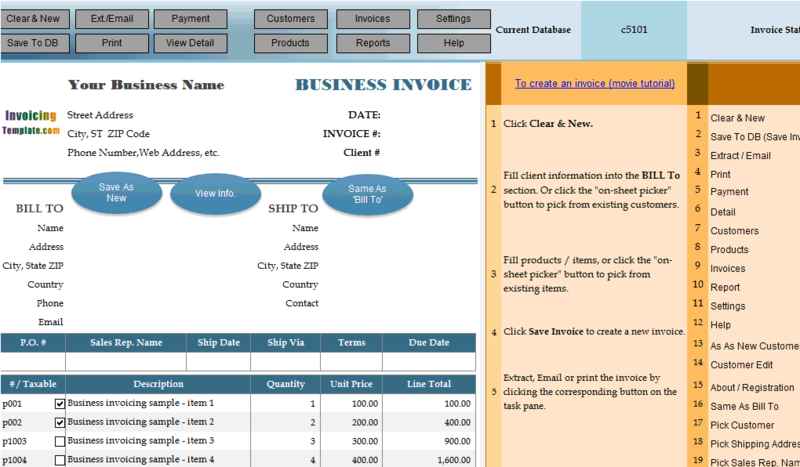 To change the tax name or rate using Invoice Manager for Excel (namely Uniform Invoice Software), which is our invoicing software program that enhances any Excel invoicing template here on InvoicingTemplate to be a complete invoicing system, first click the "Settings" button on the "Invoice" ribbon tab, go to the "Taxes" tab and then choose the number of taxes applied to this form, the names of the taxes, and the rates of the taxes. 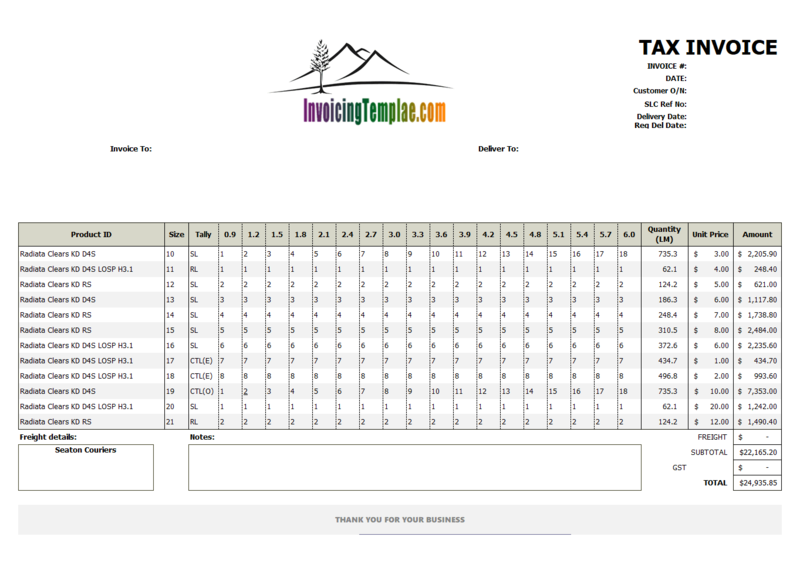 You can also enable options like "Tax invoice total including shipping cost" etc. Make sure you click the "Apply" button after modifying the taxing options, otherwise the template layout won't be changed according to the options you choose. If you accept the changes after verifying the form, click the "Save" button on Excel quick access tool bar to make the changes persistent. 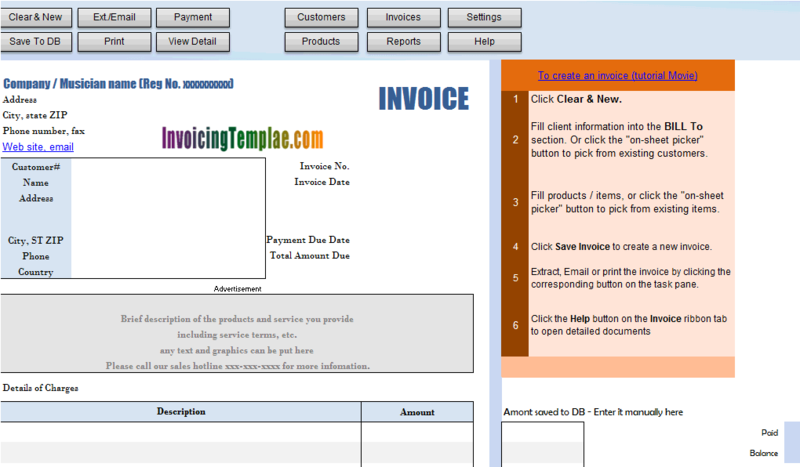 For more customization samples on VAT, visit VAT invoicing templates. Also refer to VAT invoicing rules on EU Taxation and customs union / European Commission. 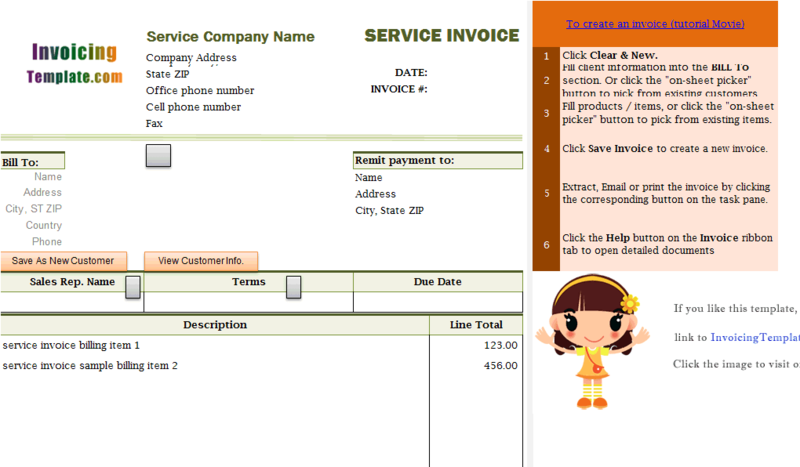 This invoice template is for the companies or organizations who offer parenting services. 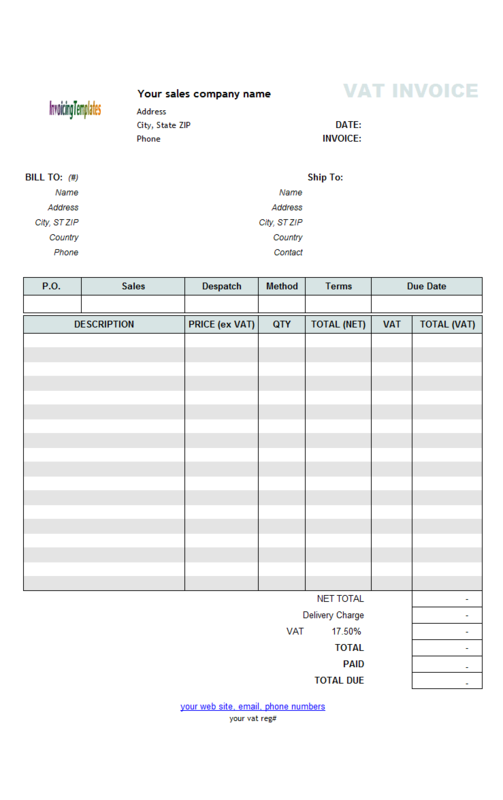 As compared to the default/standard invoice template, the "Ship To" section is removed, and a new field, Date Of Birth, is added to the Bill To section, with witch you can record the birth date of a child. 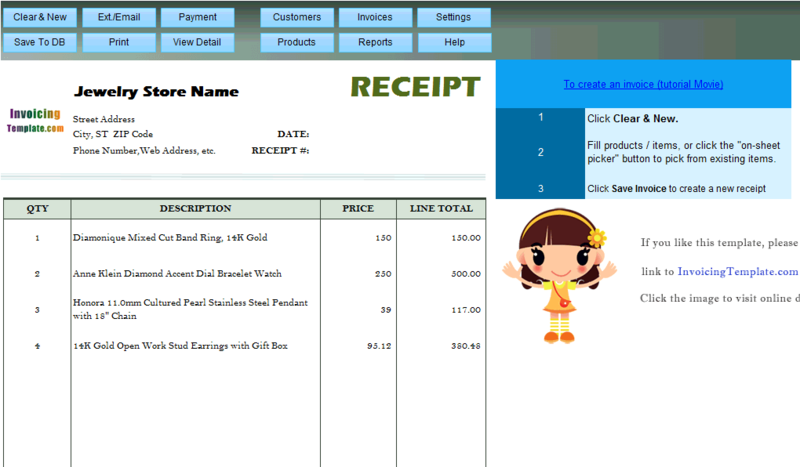 There are also a number of custom fields for the other customer-related information, such as Mother's Name, Mother's Profession, Mother's Mobile, etc., are added outside the Print_Area. 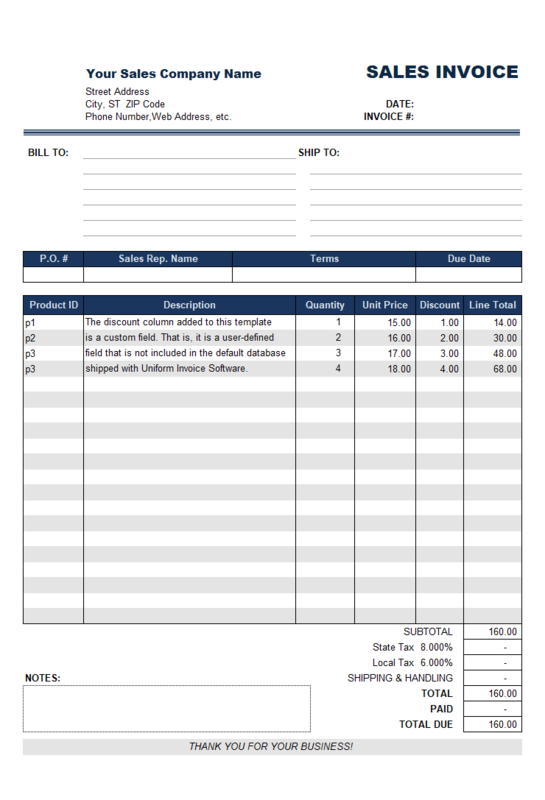 On the invoice body section, Quantity and Price are moved out of the Print_Area, and two new columns, date and Fee, are added.